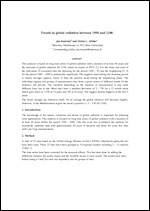 This analysis is based on long time series of global radiation with a duration of at least 40 years and the forecasts of global radiation till 2100, based on results of IPCC . For the mean and most of the individual 25 examined sites the dimming for the period 1950 – 85 and the brightening [2, 3] for the period 1985 – 2009 is statistically significant. The negative trend during the dimming period is clearly stronger (approx. factor 2) than the positive trend during the brightening phase. The individual regions and groups of measurement sites show a great variety of different trends for the analyzed sub periods. The variation depending on the duration of measurement is also quite different from site to site. Most sites have a standard deviation of 5 – 7% for a 12 month mean which goes down to 2-4% at 10 years and 2% at 20 years. The biggest decline happens in the first years.